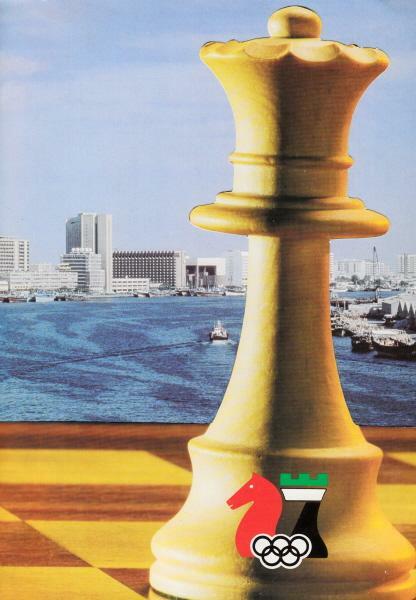 Chess Duels by Yasser Seirawan (London, 2010), page 241. There was more of the same in the 24 October issue of news flash (another inquisition), but one could see it coming. Back in July 1986 Mr Keene, in his capacity as Publicity Director, had proposed to the BCF that responsibility for the magazine be transferred to the Publicity Directorate. The Federation accepted the scheme, and David Goodman (an entirely different brother-in-law) was promptly named Editor. For good measure Mr Keene’s sister, Jacqueline Levy, became Assistant Editor. The benefits soon accrued. One news flash lead story (complete with large photograph) concerned how Mr Keene had, on behalf of the BCF (of which he is Publicity Director), presented Thames TV with a special award for its programmes (of which he was adviser) about the K-K match (of which he was co-organizer). Somehow the magazine made all this sound the most natural thing in the world. Earlier, news flash had given an account of his electioneering. Or, as the report more genteelly termed it, ‘Ray Keene is currently on a goodwill tour of the Caribbean’. But would most of the 120-odd federations be glad for him to? 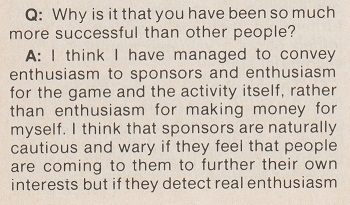 Incomprehensibly, the majority were still declining to flock to do something great for British chess; commitments were doubtless being violated as a result of the annoyingly well-researched and well-argued FIDE Facts sheets. Mr Keene fell back on the old stratagem of taking a week or two off from his Spectator column, allowing David Spanier to wave the banner there on his behalf. He also made one last-ditch attempt from Dubai to get an Airline Ticket Scandal off the ground in his Times Olympiad reports – but to no avail. The prospect of facing the Dictator in a vote-count was too much for the Democrat; Lincoln Lucena backed out and returned home to the Philippines after assuring the world that he had no wish to exacerbate any differences that might exist within FIDE – as if anyone had ever considered Lucena/Keene capable of that. The only thing now required was a brave face, and Mr Levy (in the following Monday’s Daily Telegraph) dutifully provided it. He explained how the utterly inconceivable had come to pass: ‘We came very close to winning, but once the Russians had made up their minds, we had no chance.’ Blaming the Commies was doubtless the best bet; perhaps no-one would remember that in the November Chess Life Mr Levy had said it would not matter if the Eastern bloc voted for Campomanes since other gains would ‘more than offset such a loss’. Compelled to inform his Times and Spectator readers that the Lucena/Keene dream ticket had folded, Mr Keene also adopted the most sensible course. He talked only about Lucena’s failure, making no reference to his own involvement. The running mate had run. The 5 December news flash also obligingly omitted Mr Keene’s name in its report on how Lucena had conceded victory to ‘a tired-looking Campomanes’. He had probably had a difficult day dictating disastrously. It only remained for the record to be set straight by the victims of Mr Keene’s various goodwill untruths. 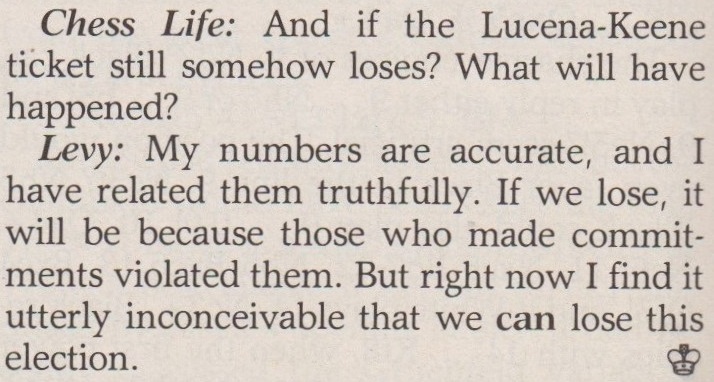 A start was made in issue 993-994 of CHESS, which included refutations of his ‘wild statements’ from no fewer than four people. Or, as the thwarted Gentleman himself would more elegantly put it, a host of prestigious commentators were queueing up and falling over themselves to deluge CHESS with a mass of entirely justified corrections of the completely false accusations made during an utterly disastrous and totally catastrophic campaign. One has every sympathy for Mr Keene in his electoral disappointment. Burdened with the unanimous endorsement of the antiquated and ineffective British Chess Federation, he unsuccessfully campaigned with the second-rate Lucena for the votes of federations whose opinions were worthless, only to discover that Campomanes was then surreptitiously dethroned by someone else. The British Chess Federation (BCF) is to be challenged by a new body aiming to popularize chess through television tournaments and sponsorship. The English Chess Federation is being set up by Mr Raymond Keene, who last night resigned as publicity directory of the BCF and English Delegate to the International Chess Federation. Mr Keene, who is chess correspondent of The Times, and also writes for The Spectator, said that his writing activities and his plans were not compatible with remaining a director of the BCF. His resignation is the second shock to strike the quiet world of competition chess and it signals a major split in the close-knit community. “I am not overjoyed with the BCF. I think they are old-fashioned”, Mr Keene said last night. 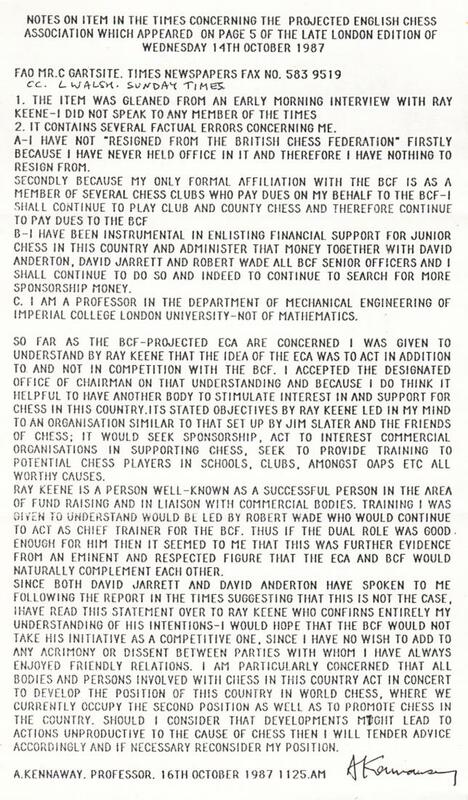 Mr Keene denied reports that his resignation was spurred by a complaint lodged with the BCF against him by Mr Tony Miles, the Grandmaster, over Mr Keene’s role in a World Championship match in Tunis is 1985, for which he received £1,000. Mr Keene confirmed that a BCF investigation of the complaint has been dropped after his resignation. In fact, the Falklands War had ended over four years previously. 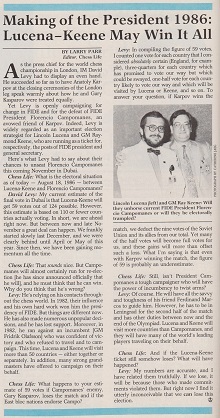 The magazine news flash contrived to avoid mentioning Raymond Keene a single time when announcing Campomanes’ victory. The Editor was David Goodman, Raymond Keene’s brother-in-law. The Advertising Manager was Jacqueline Levy, Raymond Keene’s sister. 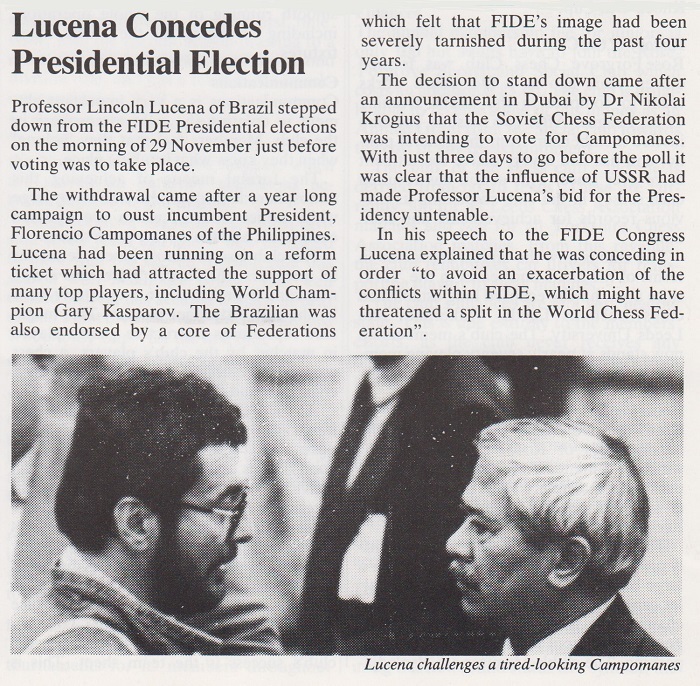 For the complete set of FIDE Facts sheets, see our feature article The 1986 FIDE Presidential Election. Additional link: Ricardo Calvo: Persona non Grata. Latest update: 9 September 2018.